An acid wash can brighten even the darkest lagoon of a pool. Acid wash pool cleaning is generally a last resort for seriously neglected or improperly maintained pools. It is popular with some pool owners, however, because it dramatically brightens the white finish of pools. Whether you desperately need an acid wash pool cleaning to restore your recreational area to safe, sanitary conditions or you just want to improve the appearance of your backyard paradise, it's best to understand exactly what an acid wash pool cleaning entails before you initiate the process. An acid wash pool cleaning literally strips a very thin layer of plaster away from the surface of the pool. 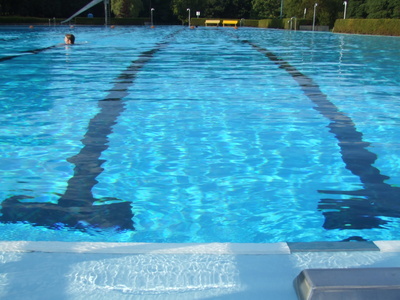 An acid wash is applied to the dry surface of the pool after the pool is drained. It is left on the surface very briefly, and then neutralized and removed completely so that it does not negatively impact the balance of the pool's chemicals later. The acid removes not only the top layer of plaster but also algae growing on the surface. It also removes oxidized chemicals that may have built up on the sides or bottom of the pool over time. It can result in a completely algae-free pool. Because an acid wash literally removes part of a pool's surface, it should not be done annually. Its effects last at least one season, and, if you properly clean and maintain your pool, they can last indefinitely. If you use an acid wash on your pool frequently, however, then soon you will have to refinish the pool because the acid washes will remove too much of the plaster and render the pool unusable. Acid wash pool cleaning works only on concrete or plaster pools. It destroys a vinyl pool liner. Before you invest in an acid wash pool cleaning, ensure that every element of the pool that will be exposed to the acid can stand up to it. As its wording implies, an acid wash is conducted with acid. This means that you will be exposed to potential chemical burns and toxic fumes. Once the wash is done, you will be left with a foamy, acidic residue in the bottom of the pool that must be neutralized effectively and removed before the pool is refilled. Safety gear always should be worn for this procedure, and an acid wash pool cleaning should not be attempted by someone who hasn't been trained in the specific process.